Starting with this one, it gets difficult. 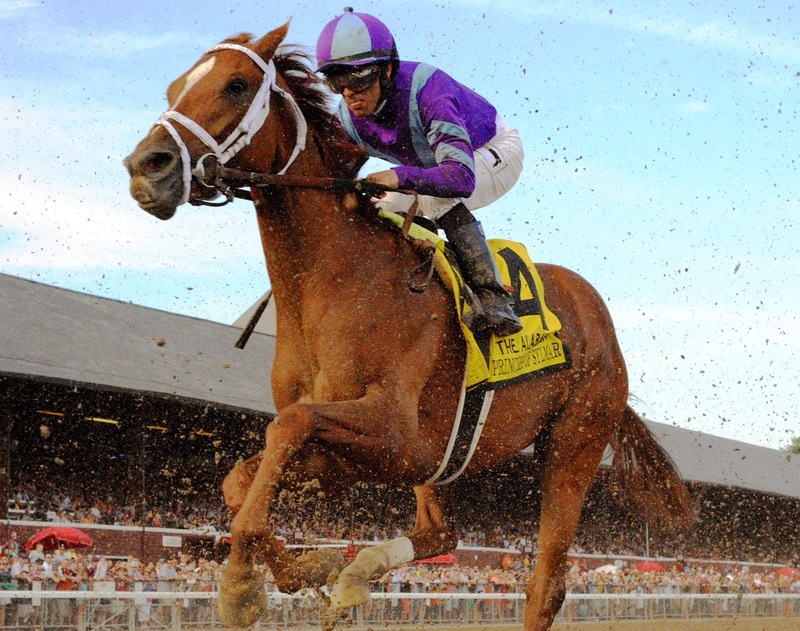 Will Take Charge winning the Travers was a relatively easy # 1 for me. But choosing # 2--and then #'s 3, 4, 5, etc.--out of so many fabulous moments at Saratoga 2013 is tough. Which to put ahead of which others? But decisions must be made. For this I get paid the big bucks. [Just in case anyone isn't sure, I do these highlights purely out of love for the Saratoga meet, and at my leisure.] So here is my next selection. 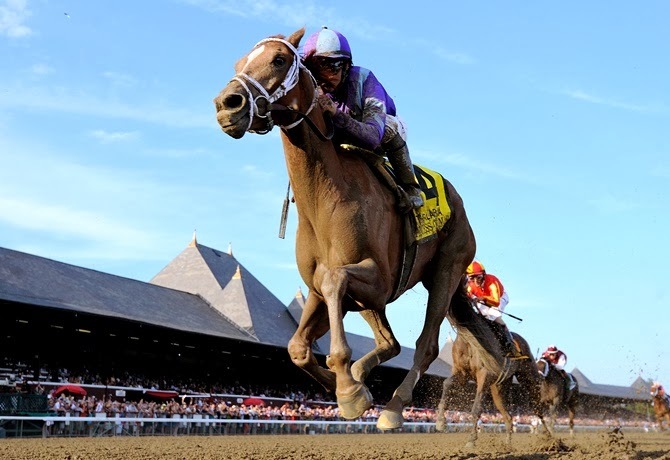 Just a few weeks before, on opening weekend at the Spa, she trounced the field in the Coaching Club American Oaks. She had previously won the Kentucky Oaks at Churchill Downs in May, driving furiously in the stretch to make the finish line first by half a length. 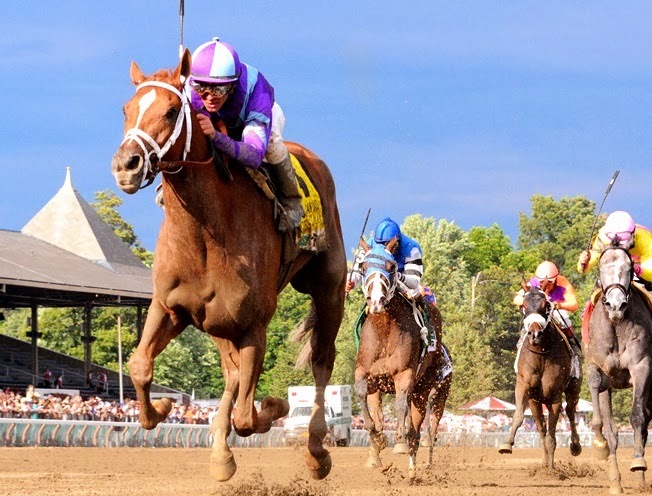 Now in the Alabama, Saratoga's premier stakes race for 3 year old fillies, Princess of Sylmar was going for her 3rd consecutive Grade 1. The daughter of Majestic Warrior, the 2007 Hopeful winner [which means she has 2 of Secretariat's daughter's on the sire side: Weekend Surprise and Take Heart] and Storm Dixie [which means she has another daughter of Secretariat on the dam side: Terlingua], was now the favorite--quite a change from her 39-1 status in the Kentucky Oaks. Held in 4th place by Javier Castellano for the first half of the mile and a quarter race, Princess was taken 4 wide on the far turn, and that was the beginning of the end for the others. She was in command by the mile, and no one else had a chance. She finished 2 1/2 lengths ahead of Fiftyshadesofhay, and there was little doubt she could have extended her lead if asked. The following month, Princess won her 4th Grade 1 in a row at Belmont, beating Royal Delta in the Beldame. A great filly with great performances providing great thrills at Saratoga. We are awaiting the decisions of trainer Todd Pletcher and owner Ed Stanco (who grew up in Schenectady) for Princess of Sylmar's 4 year old campaign for 2014. Next up in this series, #'s 3 & 4.